The new year is peeking at us from around the corner. 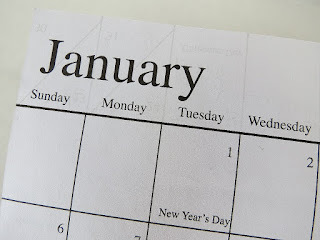 This is the time that so many people will be making resolutions, filling in all the dates on their calendars and coming up with great plans for the next 12 months. But what if all those resolutions, dates and plans are just a waste of time? In His very own words, God tells us that He already knows. He knows. There is an expected end that He has already worked out just for you. He knows every step along the way between here and there, thoughts of peace and not evil. This is the newest addition to the Carrell Wildlife Preserve. Danny found this little kitten in one of our raccoon traps. The funny thing was that there wasn't any bait in it - she was just curious and got caught. She can't be more than six or seven months old, which just about broke my heart. She's an attention hog, which makes me guess that she was a house kitty. Either she was dumped out here in the country, or she wandered away from home and didn't know where she was. 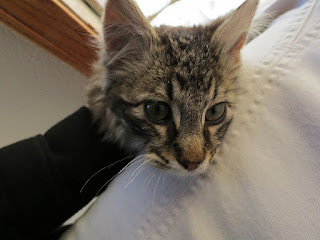 So now she's our barn kitty. That's her name. Barn Kitty. She has to be an outdoor cat because I have severe kitty allergies. Just loving on her for the couple of minutes twice a day when I feed her can be a problem. But then she sits in the window like this and I can't help myself. How long will you leave your Christmas lights up? When will your decorations go back in their boxes? How soon will family leave and get back to normal routine? Did it take long to clean up all the wrapping paper, gift bags and tissue paper? How quickly were the leftovers gone and the dishes done? Do you get everything Christmas packed up and put away so you can move on with your life? If this is our mentality, I'm so afraid that we've missed the point of Christmas altogether. I don't want the day to mean so little in my heart that it's just like any holiday of the year - because it's not. I pray that we don't rush. I pray from the bottom of my heart and the top of my lungs that we keep Christmas going. Sure, the decorations can go back in their boxes and the lights can come down, but what's going on in our hearts is so much more important. We're probably all excited with the anticipation of the next few days. 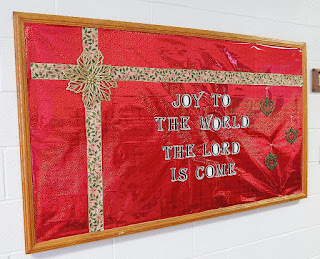 There will be friends and family, church services, evening activities and awaiting the arrival of the new coming King! Can you imagine what the anticipation must have been like over 2,000 years ago? 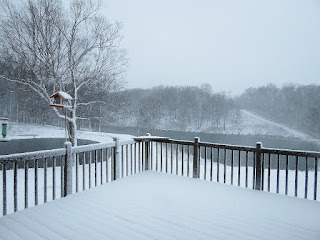 For the past two days, we've been experiencing the first snowstorm of the season. There's been no snow since March, so everyone's a little excited - one way or the other. Looks like we'll have a white Christmas after all! Who's Afraid of a Monster? This was one of my favorite books growing up. I would do a high-pitched Grover voice, and I had the entire thing memorized. Probably drove everyone crazy, but I loved this book. I recently found it at the grocery store, so I just had to get it. Reading through it, I fell in love all over again. 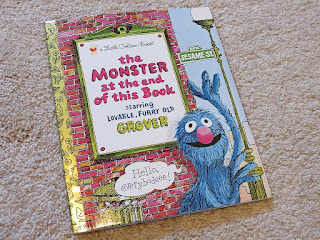 In the little bit of a plot, Grover learns that there is a monster at the end of the book. If you're aware that Grover, himself, is a monster, you can see the amazing twist that's about to take place. Grover panics and tries desperately to keep the young, impressionable reader from turning to the end of the book and confronting the monster. In his fear, he takes elaborate measures, like building a brick wall and nailing the pages of the book together, to impede process. This is what I've been saving the shells from our stuffed scallops for. 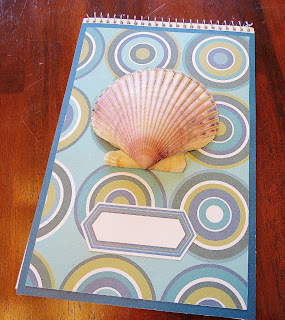 I love the look and color of these shells on the front of a journal. The struggle was actually finding a notebook large enough for the shell and without a cover that's already been decorated. I finally found some at my third stop. Then I covered it with card stock and decorator paper. The tag is a card stock sticker. Now comes the fun part - finding the perfect glue. I tried a couple before I found one that actually worked. This one is still a little too wet for my liking and water-stained the paper a little. Experiment with different ones until you find one that not only works but doesn't leak out from underneath the shell. We're supposed to have inches of snow overnight tonight, so this journal has made me think of summer and warm evenings on the beach. Maybe those are exactly the thoughts we need in the last days of December! There's something special - in my mind anyway - about getting the grocery store circular in the mail. When you love food, planning and listing and getting ready for a week's worth of menus does lovely things to the heart. So when our local store had a hugs seafood special this week, I was thrilled! Danny and I both marked up the ad and made our wish lists. Since you can't really get one of everything - as much fun as that would be - making choices is lots of fun. My favorite choice for the week were these stuffed scallops. 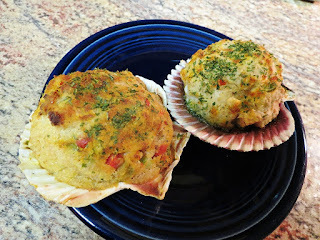 They are a gorgeous mixture of seafood nestled in a perfect scallop shell. Not only do they taste amazing, the presentation is one of the most beautiful I've seen from a grocery store. I've saved the shells and have a lovely craft project for them. Stay tuned. Everyone is striving for some kind of perfect - the perfect hair, the perfect husband, the perfect outfit, the perfect home, the perfect kids, the perfect life. Guess what - your definition of perfect may be different than God's definition of perfect. If we take a look at just a few of the Scriptures that talk about God's kind of perfection, we'll see that a change of heart might be in order. Perfect doesn't mean that you will never do wrong or have a bad day. Perfect in God's language means mature, complete and fully informed. It's about learning and growing and becoming exactly who the Lord wants you to be. Then you can behave in a perfect way because you have the tools necessary. For the next few days, people will hurry to buy gifts, rush to make holiday preparations and finally take time to breathe on Dec. 26. Doesn't that seem like such a waste? 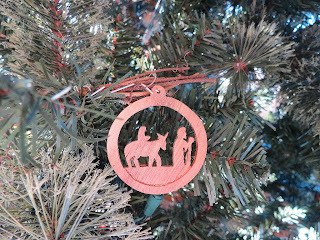 The Advent season isn't about what you can do or how much you can get. 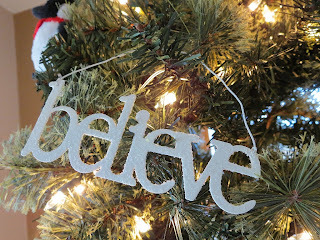 Christmas means so much to those of us who believe. 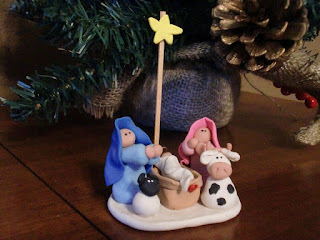 Make this a weekend of refocusing on the meaning of Christmas. 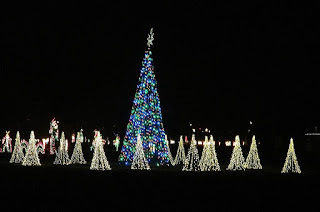 As much as we love the lights and the decorations and the presents, Christmas is leading us to Calvary. Jesus Christ was born to die. This is not a sad thing, but a reason to rejoice. This is the beginning of the salvation story. Don't the girls look like they're in the holiday spirit? You have no idea what it took to get them to sit still like this. Danny had to get involved. It wasn't pretty. But you'll notice the two stockings behind them. 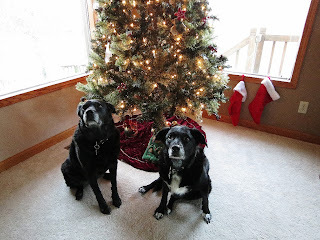 They're empty right now, but on Christmas morning they'll be full of special treats just for puppies. There are tons of great ideas out there for puppy presents. Here are just a few. Sometimes, no matter how healthy you try to eat or what's on the menu list for the week, you just need to have some comfort foods. That's what this tater tot casserole is for me. I adore every single ingredient that's in this, and the combination fulfills all those salty, meaty, crunchy cravings. 1. Preheat oven to 350 degrees. Grease 13x9 inch baking dish. 2. In large pot, brown beef over medium heat. Add water and seasoning. Bring to a boil, then reduce heat and simmer 5 minutes or until thickened. 3. Add tomato paste, green beans and mushrooms. Stir until blended. 4. Pour mixture into baking dish. 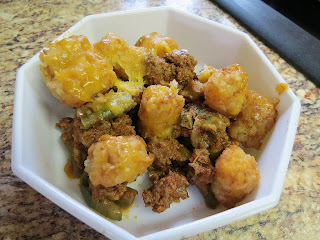 Top with tater tots. Starting tonight, I'm adding a new line of cards to our etsy shop. I think they are absolutely beautiful - I hope you will, too. They're so colorful and perfect for breaking the winter blahs. Each one has chipboard and 3D embellishments, so they're much nicer than the plain cards you'll find at the store. And they all have KJV Bible verses on them or in them. There's no better way to share your faith than by sending one of these. To see the entire line, visit www.stufffromtrees.etsy.com all this week! I wrote an article for the paper this week about Seasonal Affective Disorder. Long story short, it's harder to keep an upbeat mood in the winter because your body is so used to having more light. The sun is out for a shorter period of time right now, and the body doesn't know how to act when that light is taken away. I spoke to a local doctor about the disorder, and he gave me all sorts of information about depression, the need to stay active in the winter and how professionals diagnose SAD when it goes beyond the winter blues. And then he said something that strummed every string on my heart. Go places where there is lots of light because YOU ALWAYS FEEL BETTER IN THE LIGHT. I couldn't help but smile. I know that feeling, and it has nothing to do with winter. This is Bailey. Please note the beautiful eyes and the distinguished gray around the muzzle. She's going to be 11 years old in just a few weeks. She's my sweet Big Dog. This is Bailey's fur. 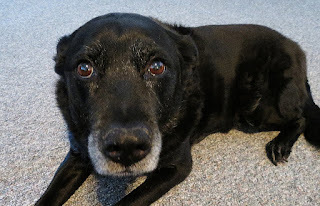 She is part black lab and part chow, so she has this weird combination fur. It is very, very thick and has a very heavy undercoat. This requires frequent grooming or you'll find bits of Bailey all over everything. Which we often do, and even more so in winter than any other time of year. Thank you to whoever invented vacuum cleaners and lint rollers. This is Bailey during one of her grooming sessions. She absolutely adores it and gets so incredibly relaxed. It takes about 45 minutes to really get all of that undercoat brushed and cleaned out, so she has plenty of time for a nap. My favorite part, though, is taking her paws and flipping her from one side to the other. It's not Bailey's favorite part, but she's very patient with me, and I think it's hilarious! 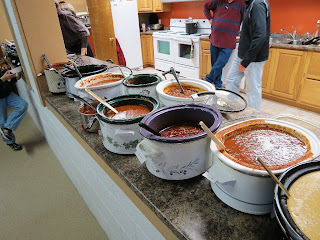 We had our church's annual chili cookoff this past weekend. I clearly remember last year's because we had only been here for a few weeks and I had to work that night. I took my supper break right as it started so I could sample everything and get back in time to get the paper out. This time was different because I specifically had the night off and I made two different kinds of chili. One was my meatless chili, which uses soy burger crumbles instead of hamburger. It's one of my personal favorites, but it's definitely a different taste and texture. The second batch was a variation on a pork chili that I absolutely adore. Apparently the judges did, too, because it won first place in the mild category. I have included the recipe at the bottom of this post so you can try it and judge for yourself. The word "behold" is used more than 1,300 times in the Scriptures. It may seem like a simple word, but the Lord uses it in powerful ways. The definition of "behold" generally means to look at or to see. But a deeper, more spiritual definition is used in Scripture - to fix attention upon an object, to attend, to direct or fix the mind. When we are called with the word "behold," we aren't just being told to look at something with our eyes, but to fix the attention of our hearts in a certain place. And if the word is used 1.300 times, that's a lot of important things that we are to fix our minds on. One of the most familiar "behold" verses in from the Christmas story.